Allied Engineering is extremely proud of the popular compact Mini-Gas series that is ideal for today’s energy efficient home, condominium or townhouse. Mini-Gas Hydronic Heating Boilers are manufactured to the highest standard for performance, efficiency, reliability and user-friendliness. • MINI-GAS Series boilers are available in five compact sizes: 50,000, 75,000, 100,000, 125,000 and 150,000 BTU/HR input in standard or packaged models. • All models are available with our unique factory mounted and wired ZONE CONTROL BOARD. • Minimum clearance of 2” to combustible surfaces on both sides and rear. 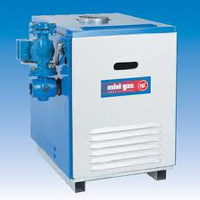 • All MINI-GAS boilers are approved for installation on combustible floors. There is no extra base or added cost required. • Approved for closet installations. • Heat exchangers designed to ASME code standards for industrial steel boilers. • ASME certified manufacturing facility. • Blocked Vent and Flame Roll Out Safety Switch – Standard. • Packaged (PS) models available with many components, some mounted and wired for your convenience. Proven performance is provided by our stringent quality control procedures and years of experience in building boilers to ASME standards. Our rugged industrial design is a durable and long lasting solution to your heating needs. The key to the boiler efficiency is our unique DOUBLE-PASS steel finned tube heat exchanger. Using the strength of 2” OD boiler tube, our engineers have greatly increased the heating surface by spirally and continuously welding a ½” fin to each heat exchanger tube. The result is one of the most efficient atmospheric boilers on the market today. Over 50 years of water heating experience backed by unsurpassed service ensures customer reliability. A Mini-Gas boiler, as your heat source, will keep you warm and comfortable when there is a call for heat. Scientifically designed roll formed high-grade stainless steel burners will give you years of trouble free service combined with energy efficiency. Tested and approved to 160 PSI working pressure. All controls and devices are factory wired. A nice feature is a molex plug used as a quick connect for the vent damper. Connection of the blocked vent safety switch to the draft hood simply clips on. Most user-friendly is our packaged boiler that includes the circulator pump mounted to a custom cast iron adapter and prewired to the zone control board. Also, the cast adapter will accept a temperature gauge (i.e. ¼” NPT) to accurately monitor return water temperature. An innovative zone control system has four separate plug-ins for zone valves and L.E.D. display lights to show which zones are being heated. Additional zone control boards can be installed to increase the zone capabilities. Manufactured to the highest standards, employing only top quality materials and workmanship our proven design features a ten-year warranty on the heat exchanger and one-year on all parts and controls. Please refer to printed warranty for details. Installation operating and maintenance instructions supplied with every boiler.